I snack all the time. I have never been one of those people that can eat three meals a day and feel full. Instead I eat small meals throughout the day. Part of this need to eat all the time goes hand-in-hand with my inability to sit still. My kids help this problem by creating messes as soon as I clean them up. They seem to have an ability to see me sit down and have a disaster that needs mommy's attention. Since I have given up gluten I have tried to find new high protein snacks to keep me full. One of my favorite snacks is nuts. They are delicious and great at keeping me full during my busy days. Last week I tried a new recipe for Moroccan Snack Mix from the September issue of Family Circle magazine, which with 6 grams of protein looked perfect for daytime snacks. This recipe has 15 ingredients. It takes 10 minutes of prep and 1 hour and 5 minutes of baking time and makes 20 servings. I had no problems finding any of the ingredients and made no ingredient modifications. Make sure to fully dry the chickpeas before baking. If the chickpeas aren't dried adequately they won't become crispy. Instead they will be slightly soggy and not have a roasted texture. Additionally, the mixture needs to be stirred every 15 minutes to ensure even browning. I didn't let the mixture cool before adding the apricots and dates. I wanted the spices to incorporate with the fruit and adding them when still hot I figured would help with this process. I followed the remainder of the recipe as written. With 6 grams of protein this snack mix is a great option for daytime snacking. However, my husband thought that the nuts weren't spicy enough and my two boys weren't fans of the mixture in general. The chickpeas weren't as crunchy as I would have liked. If I made this recipe again, I would let the chickpeas dry longer than the recipe states. Additionally, I would add chili powder in order to up the spiciness and add more flavor. With these changes I think this mix would be even better. 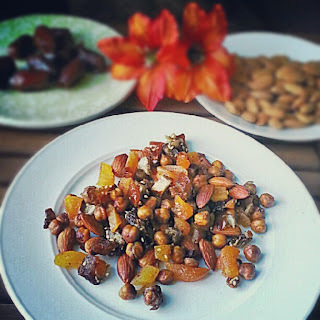 For the recipe go to Moroccan Snack Mix. That looks delicious! You should link up this recipe to my meme Wonderful Food Wednesday! What a perfect snack! It looks really good and not too tough to make either. It really is a great snack and easy to make! Thanks :) It really is delicious and easy! I didn't see where the recipe states how long the chickpeas should be left to dry... How long would u let the dry if u made them again? The recipe doesn't state drying time, which is annoying :) I would let them dry at least a half an hour. They really have to be as dry as possible for the chickpeas to be crunchy instead of soggy when baked. I would put them between paper towels and put a slight weight on top to help them dry completely.